In order to provide more variety, I converted some standard Fire Dragons into different poses. 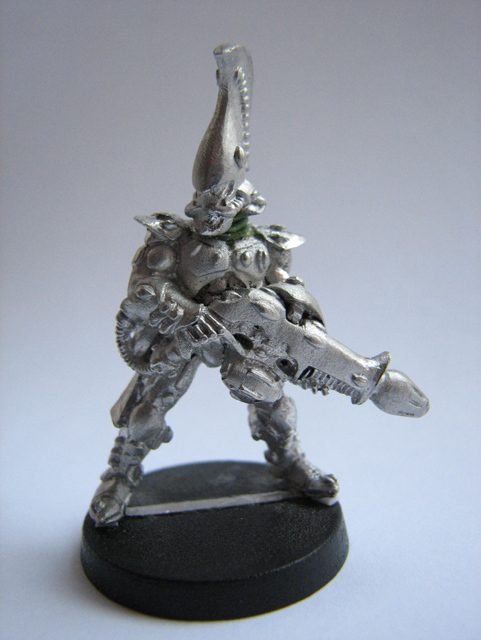 This arm holds a thoroughly converted Dragon's Breath Flamer - normally used on the Exarch model - made to look like a standard fusion gun. The fusion gun canister was made by repositioning the Flamer canister and adding thin strips of plasticard. 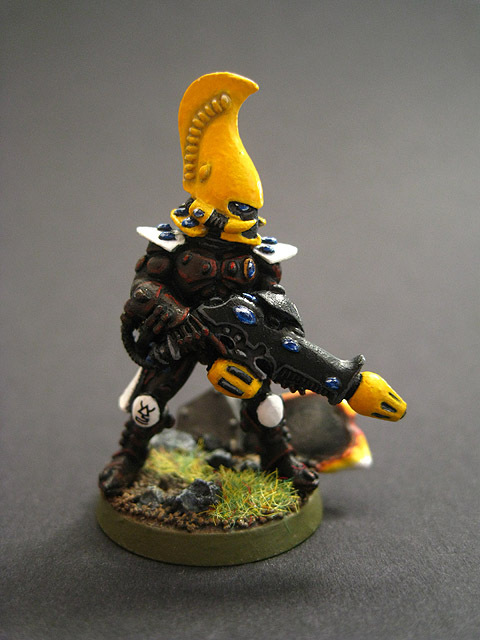 The gun's handle was sourced from another Fire Dragon miniature. 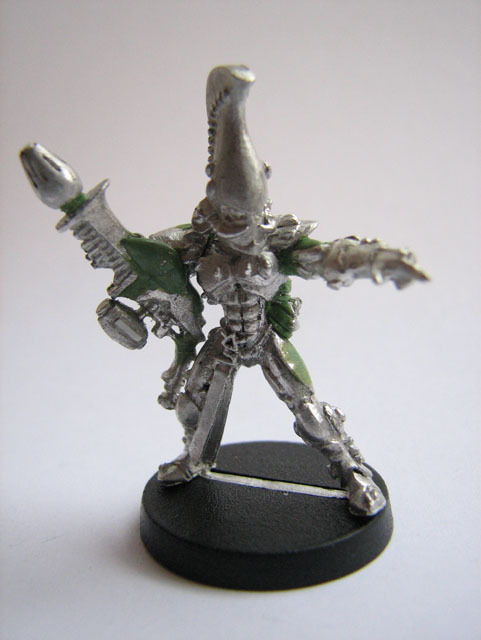 This pointing arm was left over from the second Exarch conversion. Having cut away the left arm and fusion gun from the original miniature, I had to fill in some detail using Green Stuff. 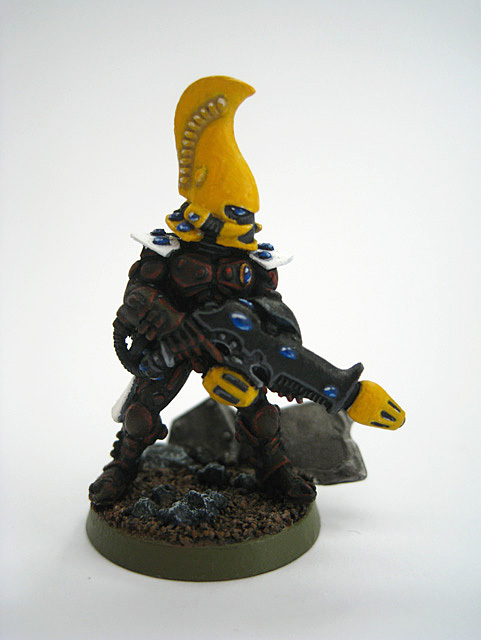 The fusion gun muzzle was taken from another Fire Dragon miniature. 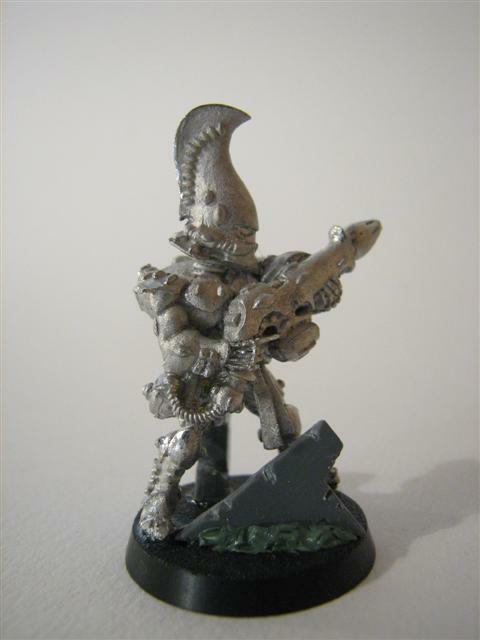 This targeter is just visible on most of the regular miniatures; usually obscured by the weapon being held across the body. 1. 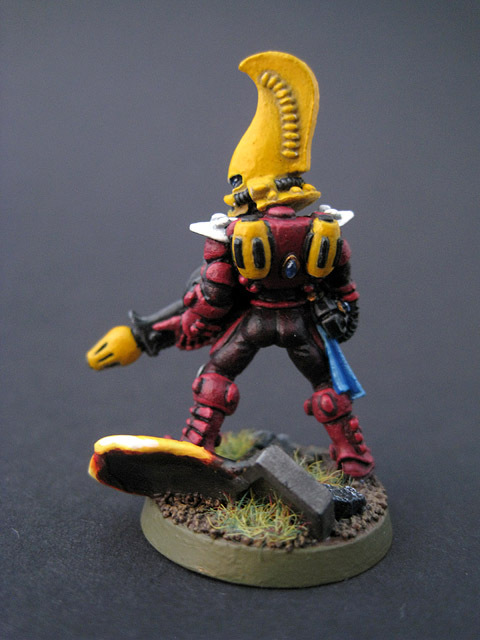 This Fire Dragon was heavily converted to provide an alternative pose for a standard squad member. 2. Another view of the Fire Dragon conversion. 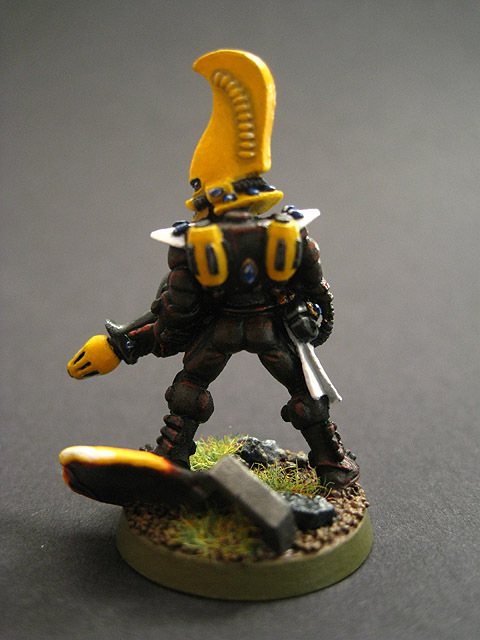 After cutting away the right arm it was necessary to restore some lost detail on the back of the miniature. 3. A view of the Fire Dragon conversion from the back. An offcut of sprue was used to represent some more wreckage. Green Stuff was used to model earth churned up by flying wreckage embedding itself in the ground. 4. A regular Fire Dragon. All of my Fire Dragons have wreckage of some kind on the bases, since they are adept at destroying heavily-armoured targets such as tanks and bunkers. Green Stuff was used to sculpt the neck. 5. A converted Fire Dragon. 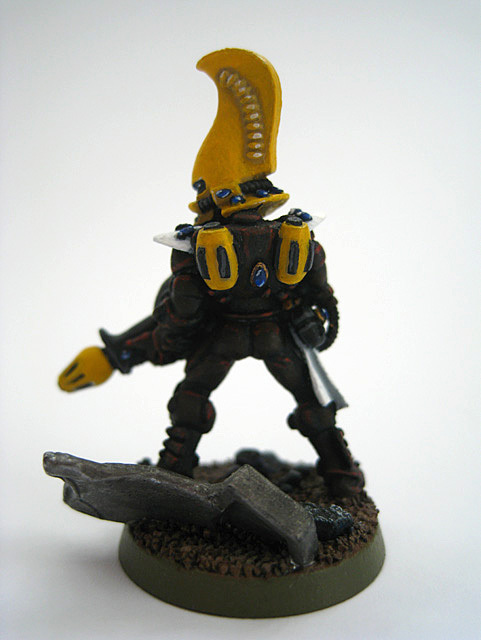 The simple head repositioning completely changes the look of the miniature and creates a new pose for one of the standard squad members. 6. This was the original colour scheme that I planned for my Fire Dragons. This was later refined with some slight changes. 7. 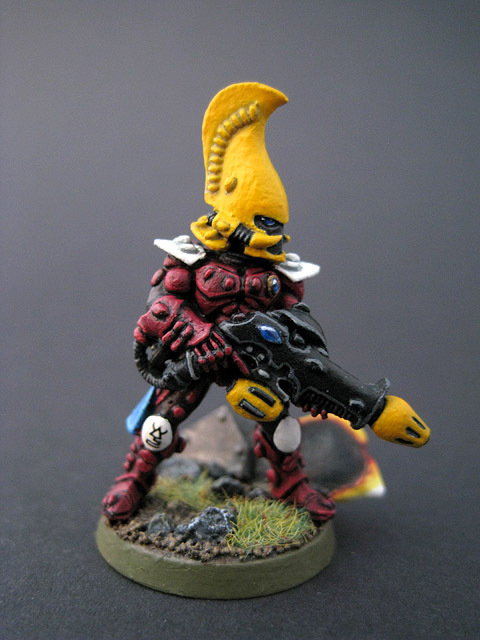 The first test miniature, early in the painting stage. I was particularly pleased with the way that the blue eye lenses turned out. 8. 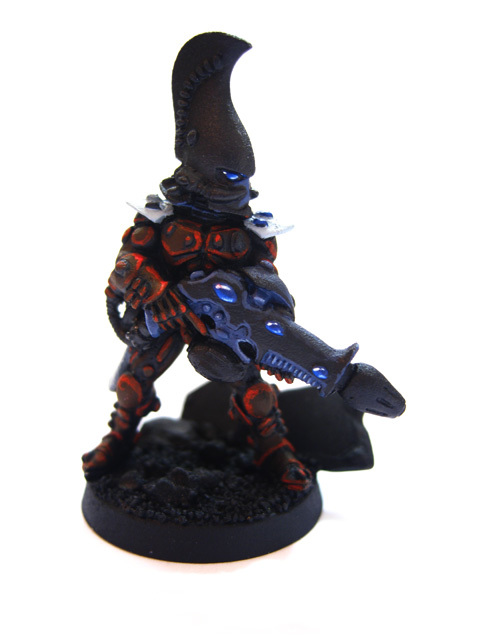 The test miniature, virtually complete; I just need to finish painting the base. 9. 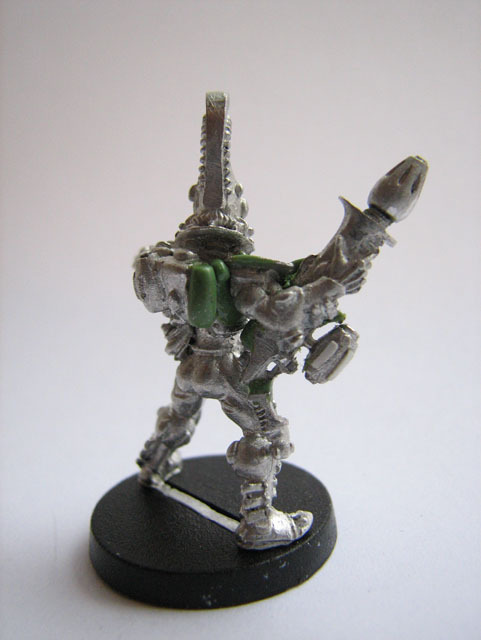 A rear view of the test miniature. 10. 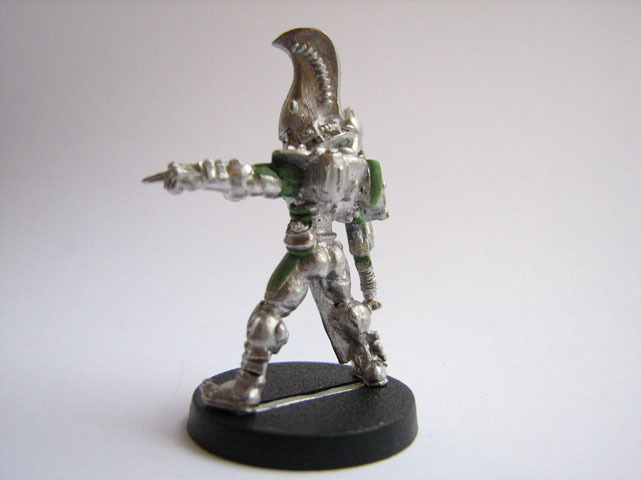 A converted female Fire Dragon. The soulstone was carefully removed from the left side of the chest and repositioned centrally. 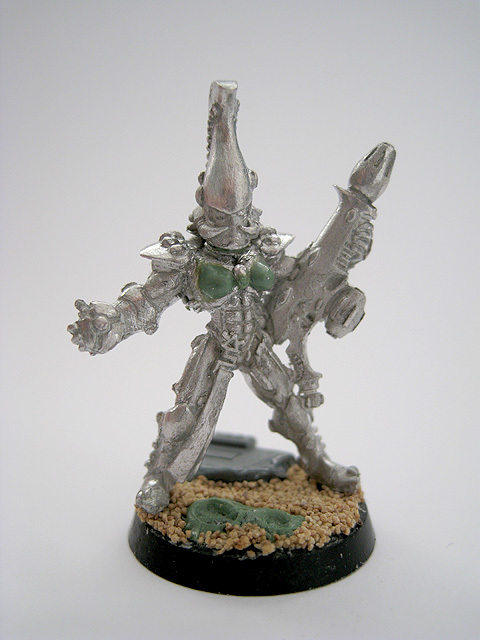 The chestplate was filed down and then remodelled in Green Stuff. 11. My first completed Fire Dragon. The molten effect on the wreckage behind the Fire Dragon will be used on the Avatar and the other Fire Dragon miniatures. 12. Rear view of my first completed Fire Dragon. 13. In mid-2018 I decide to make some changes to the Fire Dragon colour scheme. The armour is now brighter, with a clearer distinction between the armour plates and the darker undersuit. I have also reduced the number of gems and changed the sash from white to blue, to tie in with the Craftworld colours. 14. 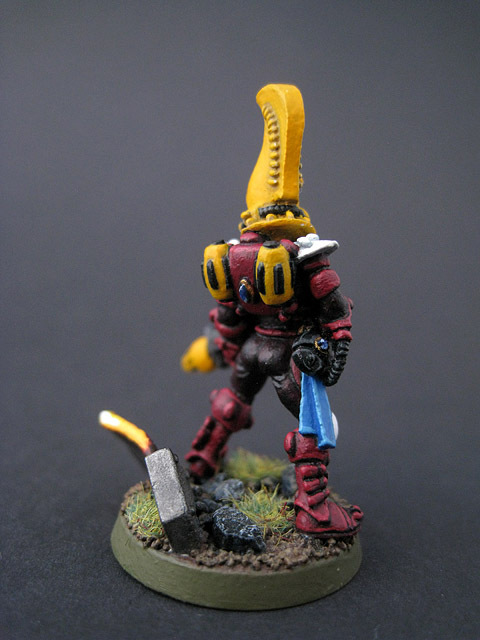 The updated test miniature, after I had applied my modifications to the paint scheme. 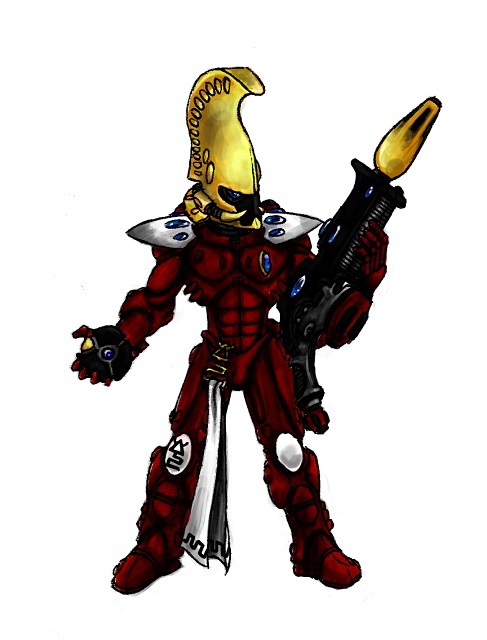 The armour is now more defined and detailed, as well as being a more vibrant colour. Reducing the number of gems has made the model less busy. 15. Rear view of the new paint scheme. The undersuit is now clearly distinct from the armour plates around the lower back and upper thighs. 16. Side view of the new paint scheme. Making the sash blue instead of white helps to bring out the blue of the remaining gems.